AP ECET Syllabus 2019: Andhra Pradesh Engineering Common Entrance is conducted by the Jawaharlal Nehru Technological University, on behalf of Andhra Pradesh State Council of Higher Education (APSCHE). The syllabus doesn’t change much every year so you can consider last year syllabus in your preparation for AP ECET 2019. The APECET Exam Pattern, as well as syllabus, has been provided through this article. You can get the syllabus from the official website. AP ECET Exam Pattern is very simple, there will be 200 Questions each having equal mark of 1. The Paper will be in English Language and more details are given in the tables below. AP ECET Paper Pattern will be different for all courses, Candidates can check all the details from the below tables. The AP ECET Syllabus will contain subjects as per the courses. The AP ECET Paper will contain the subjects and chapter of the qualifying examination. The Syllabus of Engineering courses will contain the Chapters/ Topics of class 11th & 12th PCM subjects. For More details, candidates can download the syllabus in pdf format and check every single detail. 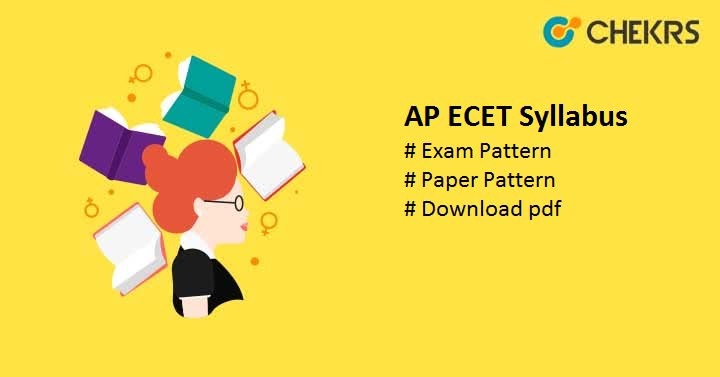 You got the AP ECET Syllabus and Exam Pattern through this article, You can also get Old Papers from here: AP ECET Previous Papers so now we hope that you will start your preparation from now. In this way, you will get more than enough time for revision. Good Luck, Keep Visiting.